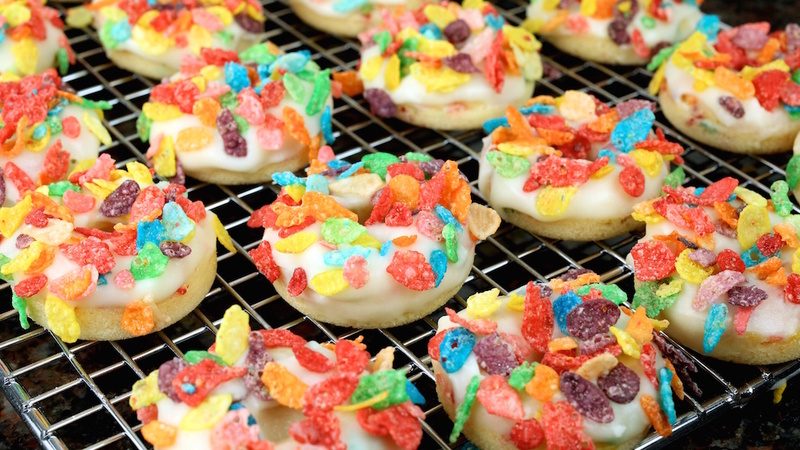 Cereal topped donuts are a huge thing right now. I support this 100%. 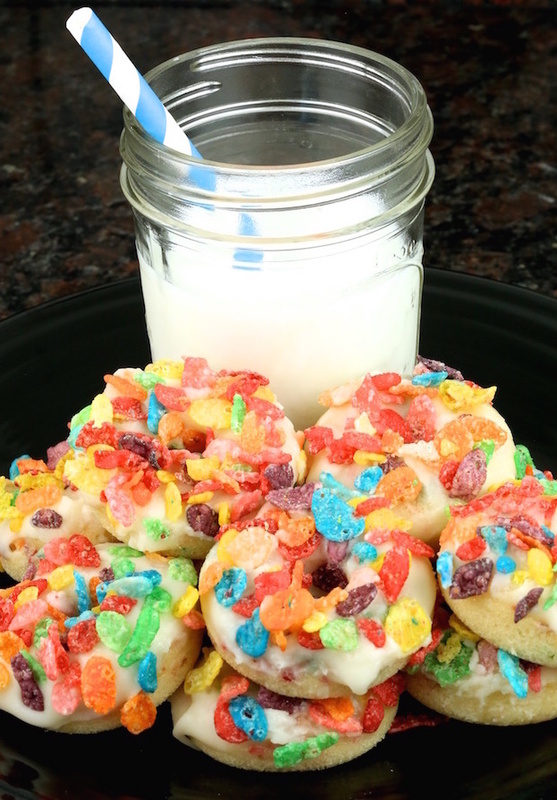 There’s just something so right about a delicious cake donut topped with some sugary cereal. Breakfast on top of your breakfast, genius! I recently bought a mini-donut pan ($9! Practically a steal! ), and knew immediately I wanted to fill it with itty-bitty cereal donuts. I decided to bake them with the cereal on top and in the batter, ’cause I’m a freaking maniac in the kitchen. One thing to note about these tiny treats, they are really only good fresh. If they sit overnight, the cereal goes stale and also gets soggy from the icing. My advice? Eat them all in a single sitting so they don’t go bad. Problem solved! 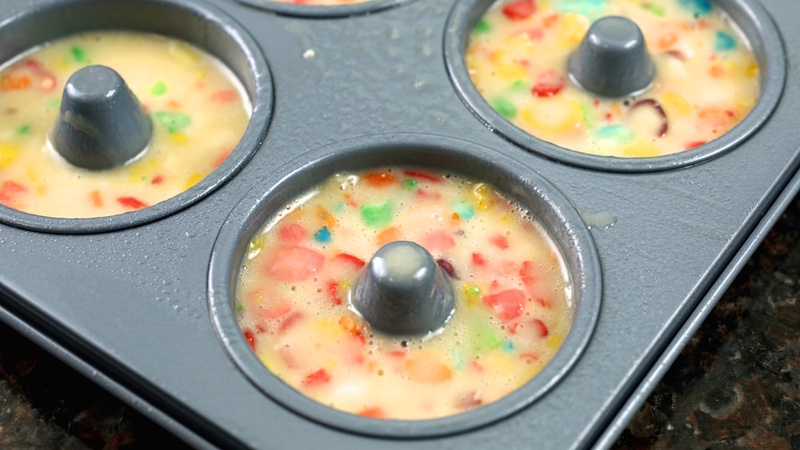 Combine flour, crushed fruity pebbles, sugar, baking powder, and salt in a large bowl. In another bowl, whisk together milk, egg, vinegar, vanilla, and vegetable oil. Combine with flour mixture until a smooth batter forms. Spray your mini doughnut pan with non-stick spray. Use an icing bag to pour the batter into the pan cavities. Fill each hole about halfway with batter. Bake for 4 minutes or until they spring back when gently poked with your finger. Insert a toothpick and pull out to see if they’re done. (If toothpick is clean, they’re ready.) 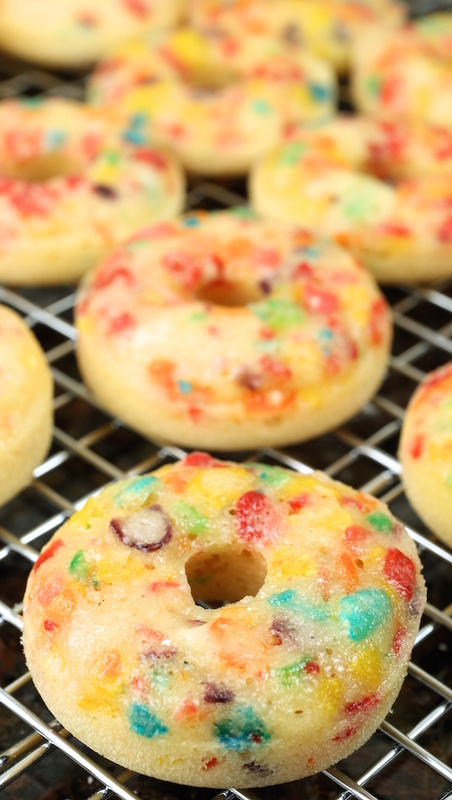 Let doughnuts cool while you prepare the frosting. Whisk together powdered sugar, butter, and vanilla until frosting comes together, adding a splash of milk as needed to loosen it if it’s too thick. 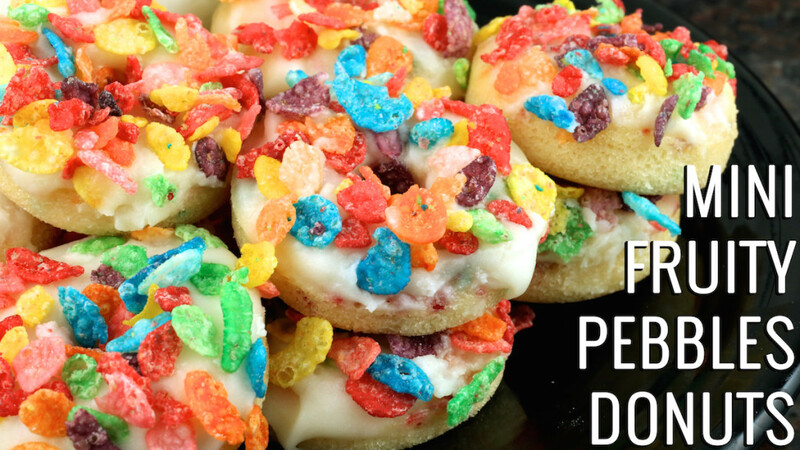 Dip half of the doughnut into the frosting, then cover with fruity pebbles cereal. Let sit on cooling rack until frosting stiffens up.